This listing is for a used Collectible figure.Check Picture for accessories included. KID FLASH - ROBIN - AQUALAD. From the hit animated series Teen Titans Go! Play out funny scenes, then swap the characters' features to make them serious, mad, or shocked - just like their animated faces on the show! H.T.F. 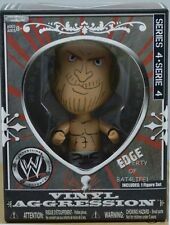 WWE VINYL AGGRESSION EDGE SERIES 4. 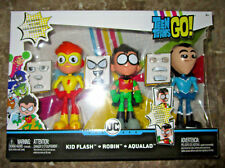 You get Robin Kid Flash and Aqualad. Toy is based on the DC Comics and animated series character Atom. Safety Tested | Approximate Height 10". As seen in great shape, cool little Vinyl Figure! Her molded hair is brown with streaks of gold. Bumblebee is in good condition. Her paint is vivid and her joints are tight and work well. TITLE : GHOSTBUSTERS ECTO-MINIS DTJ41 CLASSIC SERIES BLIND BAG. Orders placed Fri.-Sun. NO EXCEPTIONS! Her molded hair is red. Batgirl is in good condition. Her paint is vivid and her joints are tight and work well. HARLEY QUINN. I put a can of Coke next to it to show size/scale. Mostly edge and corner wear. Overall in good clean condition. Shown here so you can see the item details. WATZIT Mattel Monster High 2.5” Vinyl Figure Pet Frankie Stein. New in box. Box has some wear and a retail sticker on the side. Smoke free home. 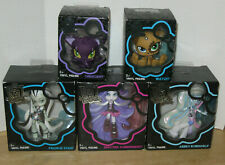 Monster High is a worldwide toy line with an animated series, books, dolls, and much more. Masters of the Universe. The Loyal Subjects action vinyl. Looks great! See pictures of actual item! Overall in good clean condition. Doing that is against U.S. and international laws. There is a large dent/squish at the front of the box, and general light wear throughout. Doing that is against U.S. and international laws. Attack On Titan Levi Mini 2" Inch Figurine Wave 2 Funimation Kaiyodo. Condition is New. Shipped with USPS Priority Mail. Attack On Titan Hange Mini 2" Inch Figurine Wave 2 Funimation Kaiyodo. Condition is New. Shipped with USPS First Class Package. 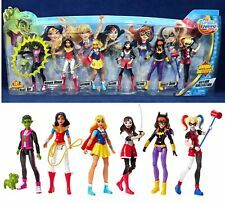 New DC Super Hero Girls Mattel Wonder Woman 6" Figure with Magic Lasso !!! TEEN TITANS GO! FACE SWAPPERS. On the animated series, the Teen Titans Go! The leader of the outrageous DC Super Hero team has basic articulation, colorful, iconic designs, 2 sets of eyes and 2 mouths! Shown here so you can see the item details. Mostly edge and corner wear. Overall in good clean condition. Doing that is against U.S. and international laws. Mostly edge and corner wear. Overall in good clean displayable condition. Doing that is against U.S. and international laws. 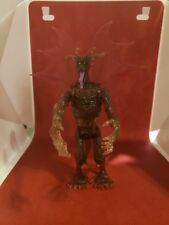 Garn He-Man and the Masters of the Universe Filmation Cartoon character The Loyal Subjects action vinyl Custom Figure Lots of pictures! Packaged carefully with love First Class USPS shipping eBay global shipping service for International Please let me know if you have any questions, thank you and happy Ebaying!